Control Charts are a considerably more sophisticated tool that requires more than a one paragraph explanation. In fact, control charting is a suitable topic for entire textbooks or multi-day training seminars. The name for this branch of statistics is “Statistical Process Control” (SPC) or sometimes “Statistical Quality Control”. The basic concept is simple, however. A control chart is a tool to determine if a process is “in control” – that is, stable, or if it is being disturbed by outside influences that vary from time to time. Samples are taken from the process periodically and a characteristic of the sample, such as its average or range (difference between highest and lowest value in the sample) is plotted on the control chart. 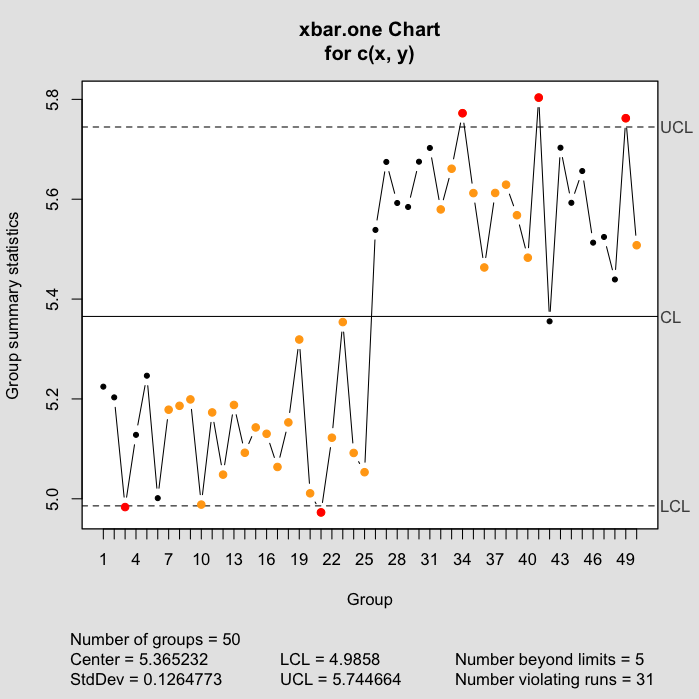 After some number of points are collected, no fewer than 25, an average, an upper control limit (UCL) and a lower control limit (LCL) are calculated and their values plotted on the chart. If any of the plotted points fall above the upper control limit or below the lower control limit, the process is being disturbed by one or more external influences. The red dots in the (rather extreme) example above show out of control points. There are a number of different types of control charts that are useful in different circumstances. There are also a number of different “rules” in addition to the “above the UCL or below the LCL” rule to determine if a process is out of control. The yellow points in the example above are points in which one or more of the other rules is violated. If you believe you need to use this tool, read a book, take a class, buy a statistics or SPC software package, or maybe all three.